← INNER CITY INSIGHT: Words, Sound & Power – MC Akala’s Life Of Rhyme & Life in Grime! THE AWARD WINNING DIRECTOR OF HOOP DREAMS TAKE US ONTO THE WAR TORN STREETS OF THE WINDY CITY WITH CEASEFIRE. Last Tuesday evening, after spending two hours immersed in of Steve James’ latest award winning documentary, The Interrupters, I staggered out of the Curzon Cinema into Shaftsbury Avenue dazed, exhausted and feeling like I’d been put through an emotional wringer. On the other hand I felt inspired, motivated and a more than a little vexed that, in the wake of last week’s riots across the UK, there appear to be so few screenings of this powerful and supremely relevant film. Filmed in Chicago over a year this dramatic and poignant documentary captures a period when the city became a national symbol for violence. For that same period, the death toll in the Chicago was more than US casualties in Iraq. While the politicians talked about bringing in the army, Steve James – the director of the acclaimed Hoop Dreams – and celebrated author, Alex Kotlowitz, took to the streets of Englewood. They filmed the gut wrenching and deeply moving stories of three Violence Interrupters – Ameena Matthews, Kobe Williams and Eddie Bocanegra – who try to protect their Chicago communities from the violence they once employed as former gang members. They work on the front line in explosive and dangerous situations. They are not there to dismantle the gangs. The see their task as saving lives – right there and then – and while all three are stalked by the shadow of redemption they also exude an inner power and a natural charisma. Kobe and Eddie are compelling in their own quiet way but Ameena Matthews is something else. Daughter of Jeff Fort, a complex and legendary Chicago gang leader who was sentenced to 155 years in prison, she is a veteran of the game but today Ameena is a muslim and devoted to her job. Watching her at work – one on one or with ‘clique’ of kids intent on revenge – is mind blowing. I loved the scene of her family getting down at a roller rink birthday party! On the streets the violence interrupters represent a not for profit organization called CeaseFire. It was founded by an epidemiologist, Gary Slutkin. As the violence in the city is like a plague CeaseFire treats it like a disease that spreads and therefore has to be interrupted. This film asks crucial questions and offers no simple panacea. It goes deep into the community and the lives of those involved. There is a lot of pain and it hurts. Moved to tears more than a few times I gave thanks for those welcome flashes of humour that allow you breathe again. 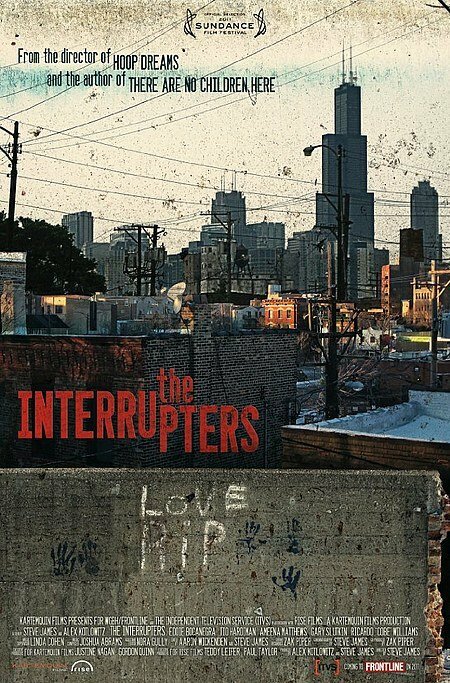 The Interrupters will eventually arrive on our TV screens via the BBC’s Storyville series but the power of the big screen is indisputable. Maybe Dogwoof and some local cinemas can be cajoled into doing a few well publicized free screenings for schools, colleges, youth organisations and the local gangs . Lessons can be learned. This entry was posted in Deep stuff, Urban runnings... and tagged Alex Kotlowitz, Ammena Matthew, CeaseFire, Chicago, Cliques, Dogwoof, Eddie Bocanegra, Englewood, gangs, Gary Slutkin, Gun crime, Hoop Dreams, Islam, Jeff Fort, Kobe Williams, Steve James, Sundandce, There Are No Children, violence, Violence Interrupters, Windy City. Bookmark the permalink.